I was watching “Hard Time”, NatGeo’s exploration of the Ohio penitentiary system, with my roomates this morning. I’d given some thought already to why it is that we like to watch prison reality shows. I used to watch alot of “Locked Up:life behind bars” at my old place and the fascination seems rooted in it being a glimpse into a very different world, one we know otherwise little about. It’s thrilling, and it makes us feel powerful to be able to observe without participating. We can judge from afar. Today one of the segments was about a program in which mothers who come into the system pregnant can keep their infants with them in a segregated nursery ward. Before my roomates had a chance to comment I announced how happy I was to see this happening. They seemed surprised, their instinct that it was awful to be born behind bars and even worse to be kept there. It is true that the babies suffer the consequences of a crime they did not commit, and yet that would be the case regardless of whether they are with their mothers behind bars. The punishment outside would just be different, a sentence in the foster care system. I have long wanted to be a foster parent but not because I believe in the system’s efficacy. In fact it is the opposite. Much in the way that I am a free range cattle rancher and vegetarian because I believe in reforming from the inside, I want to be a foster parent because the current version is largely evil and unacceptable. 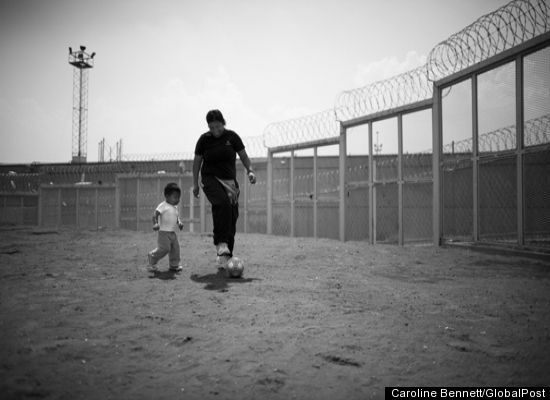 In many countries women are allowed to keep their children with them while they serve their time in prison. The Indian prison system lets women keep their children with them for the first five years. Since the women in India’s prisons are largely from the lowest castes, keeping their children with them could be preventing their starving on the streets. Indeed the life availbale to them inside may be preferable. It’s an imperfect solution to an unideal situation in any case but my sense is that it is better for the attachment needs of the child than seperating them from their mothers. Here in the States, Prison Nursery programs tend to feature resources and support for the mothers that can help prevent their recidivism and promote good parenting. I believe more resources should be put to early childhood concerns in general, behind bars and in the world at large. The Quakers have created a comprehensive report on children in prison worldwide that examines all sides of the issue, if you can handle the twenty two pages….